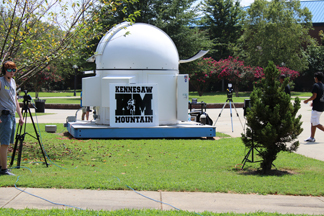 Kennesaw Mountain High School (KMHS) senior Michy ducked inside school’s courtyard observatory to check that the telescope was programmed correctly to view the impending eclipse. 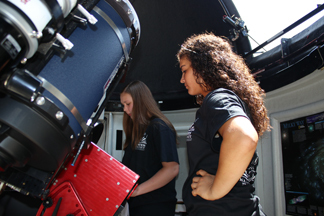 Astronomy teacher Berkil Alexander helped students set up additional telescopes outside the observatory. Meanwhile, KMHS sophomore Mathew Brown kept tabs on reports of observed environmental changes across the country via NASA’s “Citizen Science” project. Brown’s video production classmates focused cameras, adjusted lights and prepared to countdown to the kick off of the school’s live “Teachable Moment: Eclipse Across America” show on August 21. 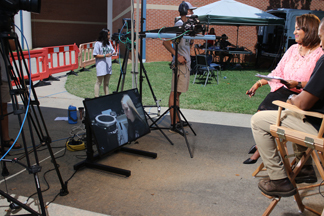 Then, while students around the country tuned into NASA’s broadcast coverage, Cobb County School District (CCSD) students were able to watch a live, locally broadcasted, eclipse show—produced by students, for students. The eclipse show, which featured live images transmitted from the telescope mounted inside the observatory, transformed the rare phenomena into a teachable moment for CCSD students. From educating students about what causes an eclipse and how to safely view the phenomena to exploring how past eclipses impacted ancient societies, Kennesaw Mountain students produced an education-packed show. KMHS, which is a STEM-certified school, emphasizes STEM in the classroom and according to Assistant Principal Lexie Bultman, the eclipse show gave the high school an opportunity to share their STEM resources with students across the district. 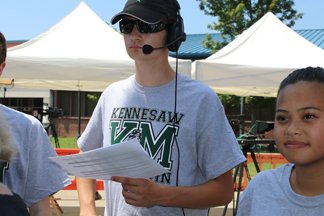 Alexander described the eclipse video production as an excellent example of interdisciplinary education. It brought history, art, technology, and science teachers together to achieve the same goal of educating students about the eclipse. Michy, who spent most of the eclipse period huddled inside the observatory, has already been bitten by the science bug. The senior helped establish KMHS’s Student Teacher Astronomical Research Society (STARS) club to encourage her classmates’ interest in space. During the eclipse, Michy’s job was to keep the sun in frame on the telescope. The telescope image she controlled was broadcast to CCSD students and staff throughout the live eclipse show. “This is a dream come true for me being able to witness the solar eclipse,” Michy said. Her ultimate dream is to become an astronaut. A 2015 Cobb Tank grant awarded to Alexander helped fund the construction of the high school’s telescope observatory, which served as the backdrop for the live show. Alexander’s plans for the August 21 eclipse day started before that. He marked his calendar five years ago. The moon may have moved out of the path of the sun, but the eclipse excitement hasn’t ended for Alexander. Photos: 1. 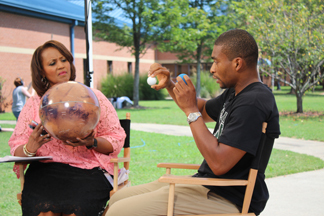 Astronomy teacher, Berkil Alexander with Mathew Brown and students reviewing program. 2. Michy checking telescope, 3. Video production class students, 4. CCSD Director of Communications, Donna Lowry and Berkil Alexander watch program feed. 5. Berkil Alexander demonstrates how eclipse transpires to Donna Lowry, 6. KMHS Observatory.